I’ve been scouring around TripAdvisor for a few weeks now looking at London’s food establishments to see if any halal restaurants had made the top 10. Sadly not, but with my geeky researching skills (and a ridiculous amount of spare time) I came across what seems to be a “boom” in a certain type of cuisine that appears to be mostly halal! No, no, you burger lovers, it’s not a new halal burger place; it is in fact Ethiopian food! [Is there a sigh in disappointment?] I’m not one to shy away from trying new types of food even if it means saying no to a good juicy burger once in a while (I don’t think I can). As expected, nobody wanted to come with me, absolutely no one. So I turned to the two people in my life who can never say no to me – Mum and Dad! Arriving at Queen of Sheba on a Saturday evening and feeling pretty carnivorous that day, after much deliberation on the menu, we opted for the meat platter. This dish is to be shared between two to three people and we decided to substitute one of the chicken dishes for a fish dish (which was a £2.50 surplus charge). So we waited for our food patiently, and we waited, and we waited until finally 25 minutes later the waitress came out with our platter. The kind waitress began to explain to us how to proceed in eating this feast. “Take the roll, rip off a piece and then scoop…” we stopped her right there – we were the hand eating professionals, we knew how to eat this. Turned out we got the whole concept wrong after looking at other people eating – this was a very sophisticated process that people really need to pay attention to when the waitress begins her demonstration. But that’s beside the point. I’m here to talk about the food! Just for the record, curries are known for not being the greatest type of food to photograph, so be forgiving with the images. I don’t really know how to explain what this is, but it’s some sort of flatbread with a spongy like texture. 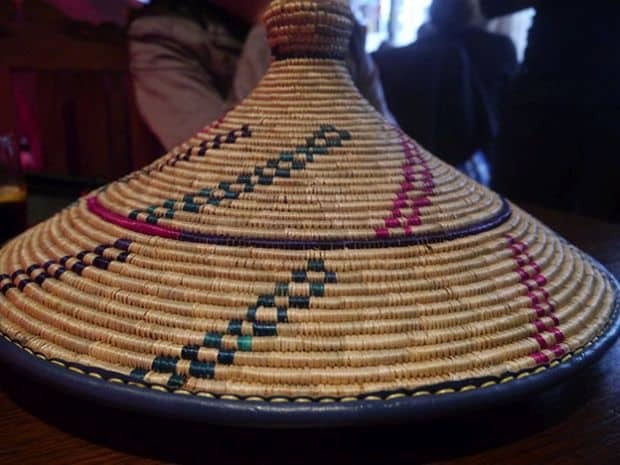 This, in fact, is what makes or breaks your experience at the The Queen of Sheba; the “injera” has a somewhat vinegary taste to it that balances the strong flavours of the curries chosen – you either hate it or you love it. Cabbage is a pretty boring vegetable that is so often rejected by the majority of us; it’s not exactly appealing either, but with an Ethiopian twist, mixing with potatoes and carrots plus seasoning, it ended up being okay on its own and made a good condiment to all the other stews. The beef was woody and had a smoky taste to it, but it may have had too much flavour due to all the different spices that were put into it; spices like ginger, garlic, and cardamom; so much that I couldn’t actually taste the meat, but enjoyed it nonetheless. There was a yellow stew on the plate and I still have no idea what it was. I even looked at the meat platter selection on the website’s menu and do not have a clue of what it is. It seemed to be split yellow lentils and was delicious, even for a vegetarian stew! This spinach stew was decent, but was almost on the borderline of being bland. I couldn’t really taste much of the onion, garlic, ginger or jalapeno that had been mixed in to it like mentioned on the menu. I don’t know about you guys, but to me, the taste of lamb is really, well I guess, lamb-y. After trying to substitute it for the fish and then failing, we just accepted the fact that the lamb-y lamb would have to be present. It was actually really good with the soft lamb being mixed with a creamy buttery sauce. The sauce had a slight turmeric taste allowing the other flavours to really stand out. Oh chicken, we meet again. Surprisingly, I preferred the chicken to the beef but let’s just keep that between you and me. The best meat of a chicken is the dark meat, so mainly the thigh, so our chicken was ever so moist and succulent. The stew that it was served in was rich in flavour with a spicy kick hitting you after every few mouthfuls, and this is coming from a non-chicken fan! The white flaky fish was my absolute favourite choice of the night. It was tangy and provided a huge burst of flavour in every bite. I kept asking for more, and more, and more until I ended up finishing the whole dish and only leaving around two chunks of fish – one for mum and one for dad. 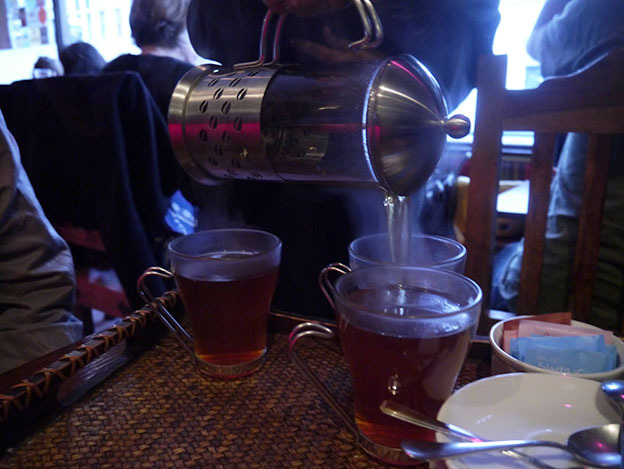 We then opted for some spicy Ethiopian tea which was definitely spicy with all the cinnamon and cloves that were boiled with the tea. The bill came to around £55.40, which isn’t cheap but is around the average price for three people at restaurants these days. The food was good, but the flavouring was really strong in comparison to the usual Indian or Pakistani curries, hence the vinegary Injera. The restaurant began to get busy at around 7pm with people who had no bookings being turned away so be sure to book a table a few days before you plan to visit! The service was friendly and smiles all around, but with one waitress covering 12 tables – the necessary attention that should be given to customers was skipped several times, which then became frustrating when wanting a bill or the dessert menu. A few tips in case you plan to visit the restaurant- go for the meat/veg platter like we did so you get to taste a little bit of everything at a cheaper price and then decide if you like it or not. It may not look like a lot but we didn’t even finish it and ended up waddling to the car and completely stuffed to the brim of our skin. And number 3, don’t be squeamish about using your hands to eat, it makes it that extra bit tastier plus they provide hot hand towels and forks if you really need it. Despite the few let downs, I really do have to say that the The Queen of Sheba really is the Queen of my heart (Corny? Me? Never!) It was a fresh new experience that I haven’t seen much of around London and it’s beginning to gain its much needed popularity. So if you’re in the mood to truly dig in and have a satisfyingly tasty meal, then pay a visit to Queen of Sheba in Kentish Town. 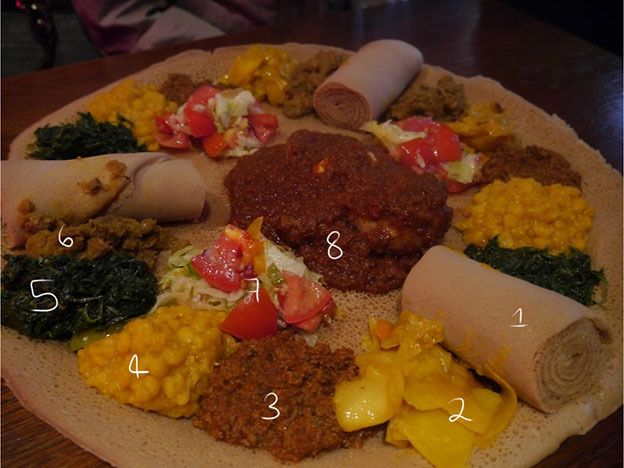 The food was great, I am ethiopian and this was cooked to perfection apart from number 8 which was supposed to be spicy and stewed longer then it was this time and wasn’t made how it should have been. Waited only 20-30 mins which was no problem as long as the food is great we were happy. Excellent service and lovely atmosphere I certainly will return again. Hi, I check their website but didn’t see anywhere that it is halal?